If you are surfing the Internet, minding your own business, and receive an access denied message, you might understandably wonder why. As one Internet surfer discovered, he was trying to go to a legitimate web site to book a service in a country he was planning on visiting. Imagine his surprise when he see the image below in his web browser! However the IP address of our web surfer is not on that list. 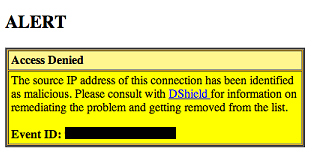 A query of Dshield does result in some hits, in fact there are 9, all from the 11th of October for port 80. Not exactly an aggressive attacker hacking his way across the Internet. My guess would be clicking on invalid links where there used to be web servers, leading to reports of dropped traffic from that IP address. What we know is that a certain vendor that shall remain nameless for the time being is making use of Dshield data incorrectly and inappropriately, and they should stop. If you recognize this error message you know who you are. If you make use of this vendors equipment or software be advised that whatever feature you have turned on is blocking completely innocent users trying to buy your services. It is not making you any more secure at all. I am not fond of blocklists or blacklists at all, and this misuse is not a particularly good idea.